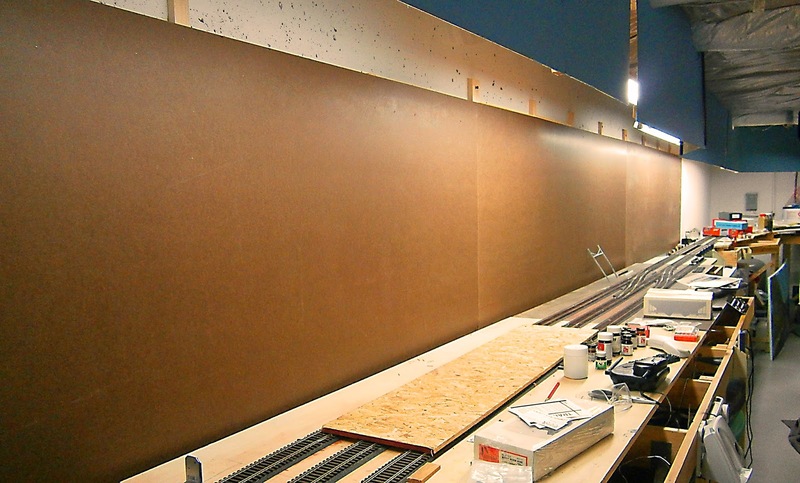 2-Rail O Scale Railroading: Woah! It's Been a While. Woah! It's Been a While. 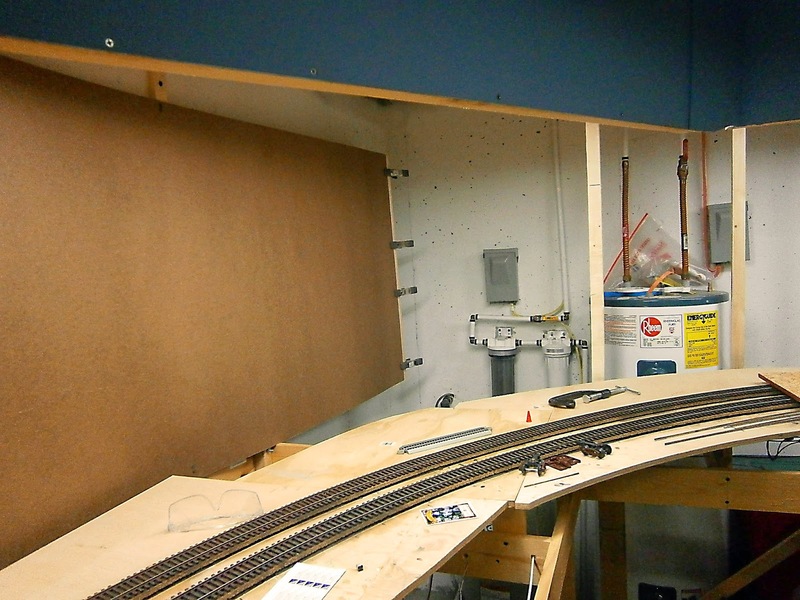 2013 was not a good year for my model railroad. The job that I had during the year put tremendous demands on my time, especially travel demands, and my railroad suffered for it. The job suffered too and did not end well. However for last couple of weeks I've started a new job and I'm very hopeful that this one work out better and I'll have more time for the railroad. Essentially not much has been done on the railroad since my last posting execpt for last couple of weeks I've started to put up backdrops; more on that later. Also during the year, and contributing to my lack of layout building, was the fact that in July I injured my knee and I wasn't able to get it repaired, again due to work requirements, until November. It's very, very difficult to build a railroad when you're on crutches. That is not to say that I didn't do anything in model railroading during the year. 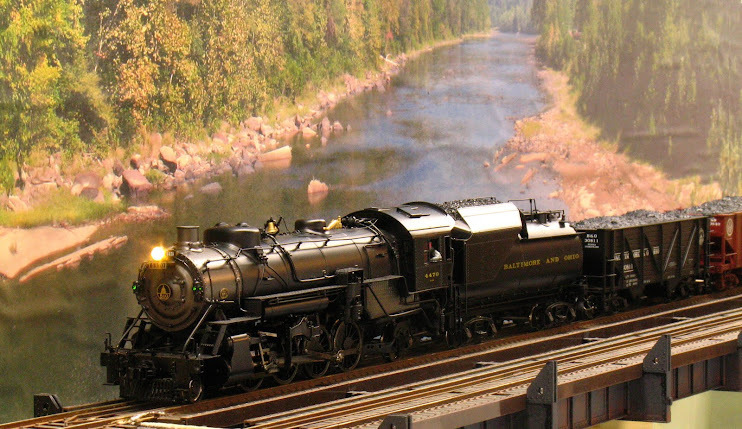 I gave my clinic on the LaunchPad for Model Railroading at 3 NMRA conventions: one in April in Mississauga, Canada; another in July in Atlanta at the NMRA a national and the final one in October in Rockville, Maryland while I was on crutches. In September, one of my daughters, who was going to an overseas teaching assignment, left her cat in our care. Because I did not know how the cat would react to the layout, I decided, reluctantly, to take most of the rolling stock off of the layout. 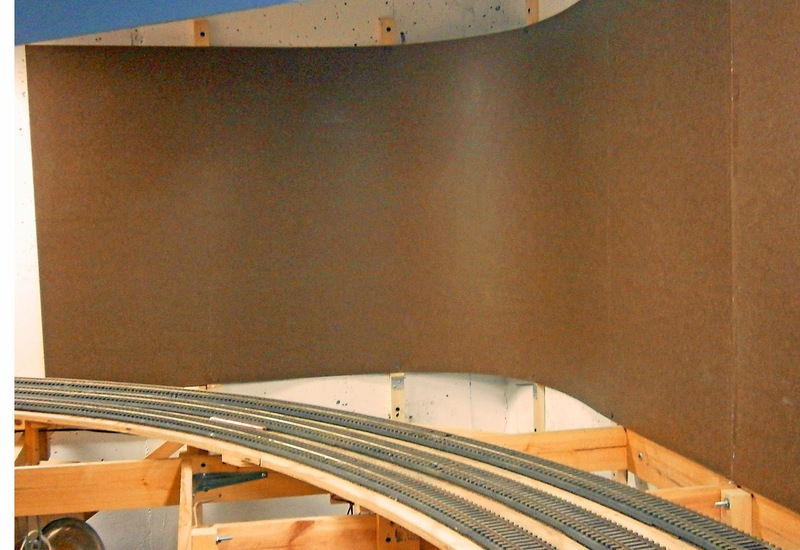 The prospect of a cat getting on top of the layout and knocking rolling stock to the floor, at 60 bucks a pop for the average O scale car, was a prospect too horrible to contemplate. 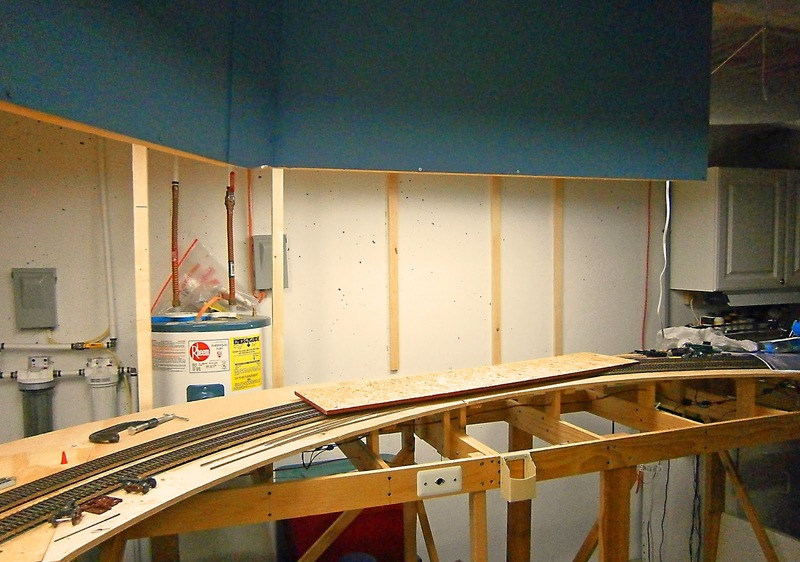 It was very emotional to take everything off of the layout thereby rendering it useless until such time as I could get the rolling stock back on. Enough for the retrospective. I've been stockpiling lumber in an attempt to get everything ready for completion of the main line. 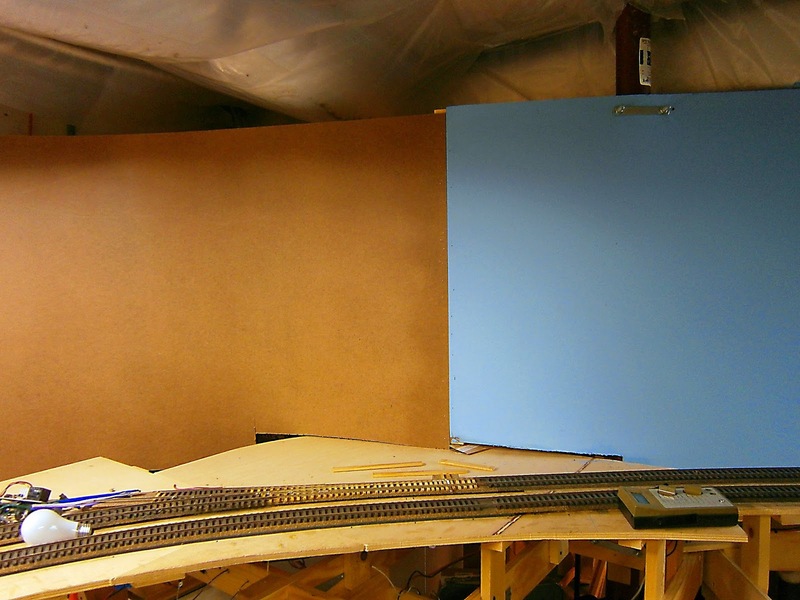 I've taken the opportunity of most models being off of the layout to begin to put up the backdrops that I didn't put up when the bench work was built. I've used 1/8 inch Masonite for the backdrop held up with 1x2 lumber, self tapping concrete screws and construction adhesive. The corners are coved at about one and a half foot radius. 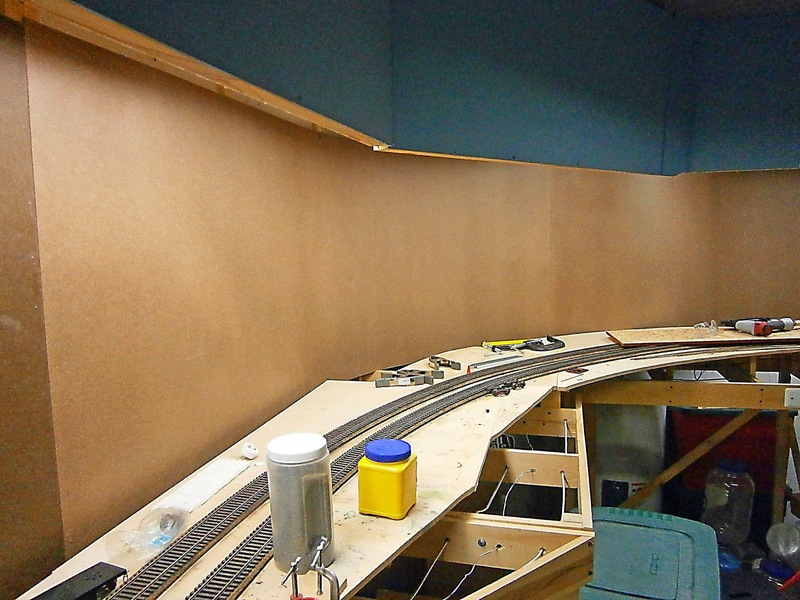 As of today about 1/2 of the layout is done. 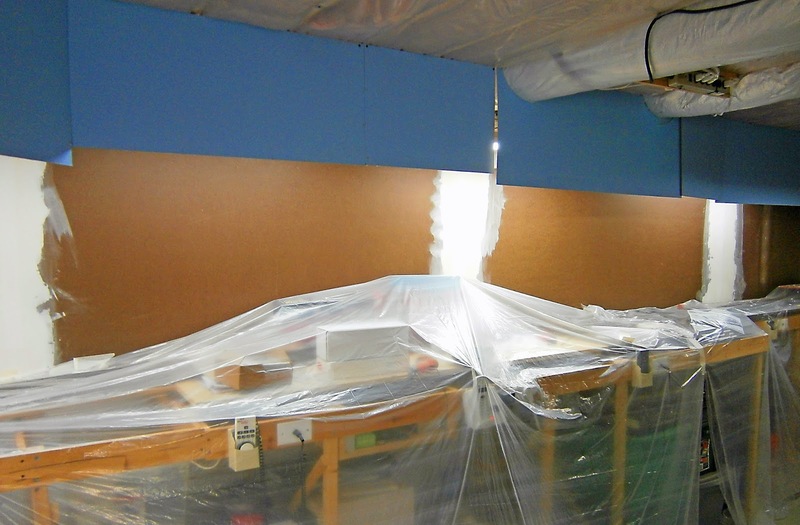 Along one long wall of the basement; around the water heater (which involved several reverse curves in the Masonite) and along one of the short walls. 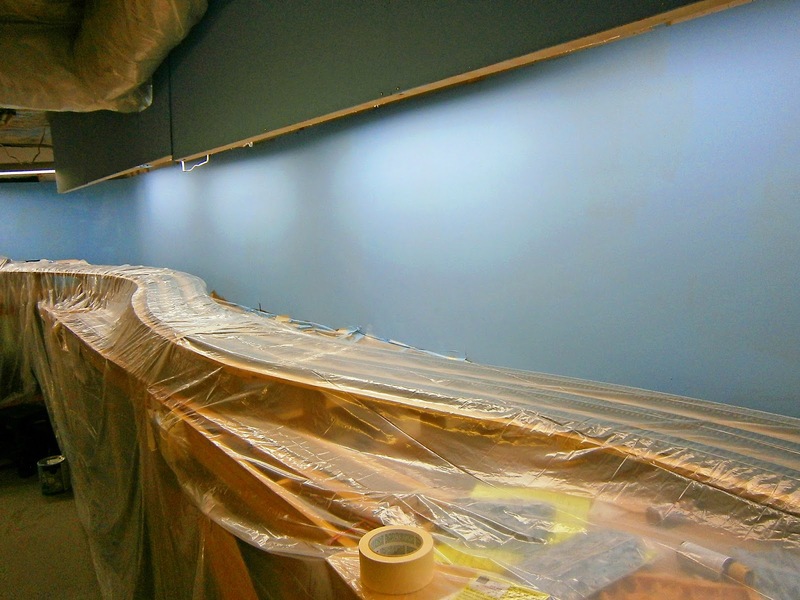 The new work was joined to the backdrop on the Cheat River grade, so now that part of the layout has a continuous backdrop. See the photos which follow. At M&K Jct. - The Cheat River photo backdrop will be replaced by a fresh print. 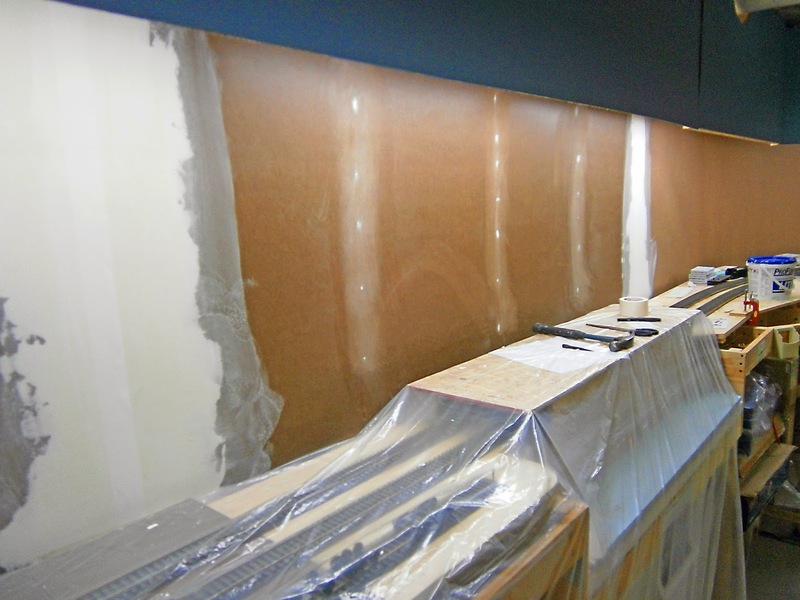 The first coved corner. 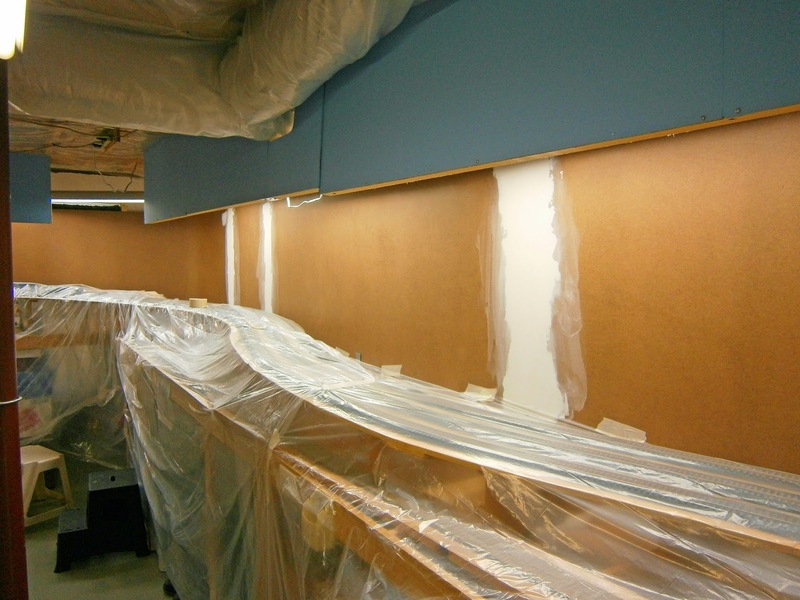 Here's where I learned that, contrary to what's on Masonite's website, Masonite will not bend down to 1 foot radius. Approaching the water heater along the Cheat River grade. Further along, the supports for the backdrop are ready. The Masonite begins to curve with the Cheat River grade. The water heater is behind the "S" curve in the Masonite in the center of this pix. The new backdrop is joined to the already painted backdrop at the top of the Cheat River Grade. Here are some shots of the joints taped. That's a job that I hate, but it's necessary. 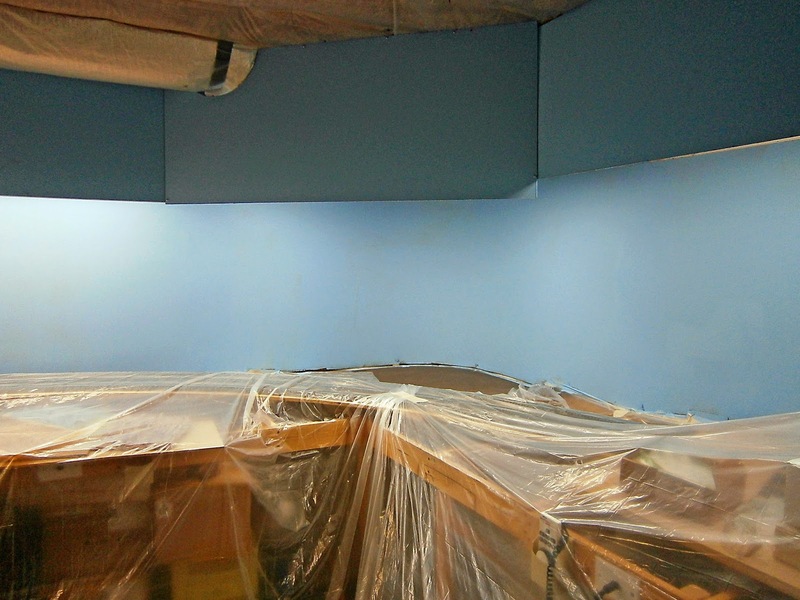 Today, the first coat of paint went on and, I must say, that the painted backdrops change the entire look of the basement. It's been a PITA, but I see that it's worth it. Here are some shots looking down and then looking up the Cranberry grade. 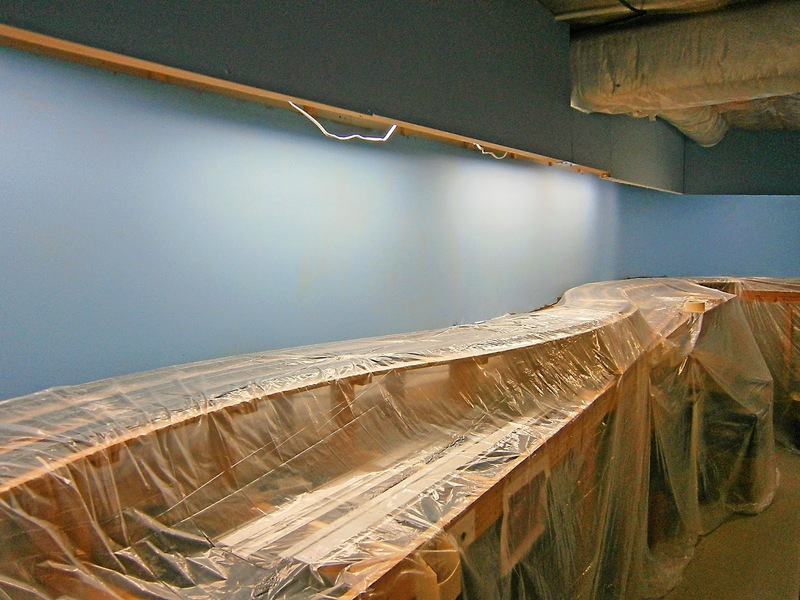 The second coat of paint will be finished by the end of the week. During this work I've learned that the essential tool for putting up a backdrop of this kind is a air brad nailer. With it properly adjusted I can nail the Masonite to the 1x2 supports (1x3 at the joints between sheets) and have the nail heads flush with the surface of the hardboard - no setting and filling of nail holes required. The work went much faster with this tool. 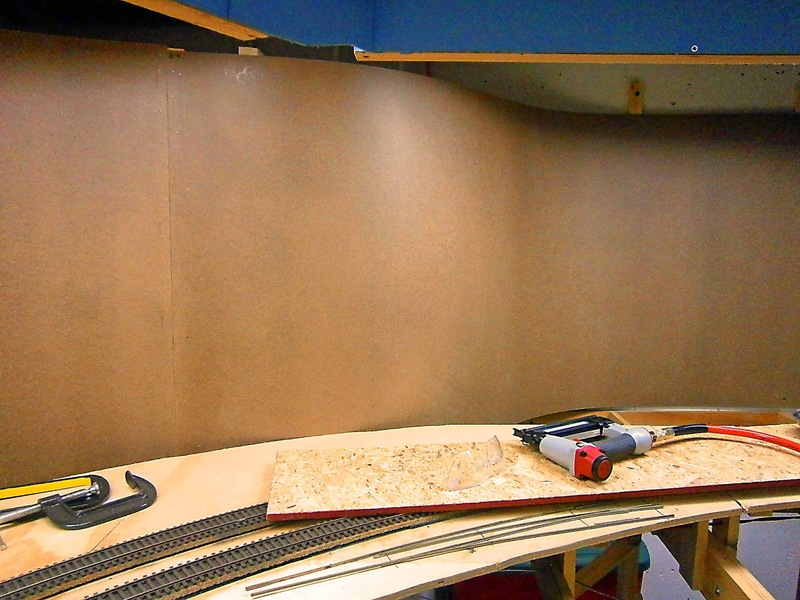 Now that the backdrops are going up, I can begin scenery. There was no point putting up scenery if a backdrop would have to be lifted into place over it. I've gotten over my apprehension of doing scenery and I'm anxious to get started.